This entry was posted in Cycling techniques and tagged chainrings, gearing, shifting, shifting technique by Kevin Murnane. Bookmark the permalink. 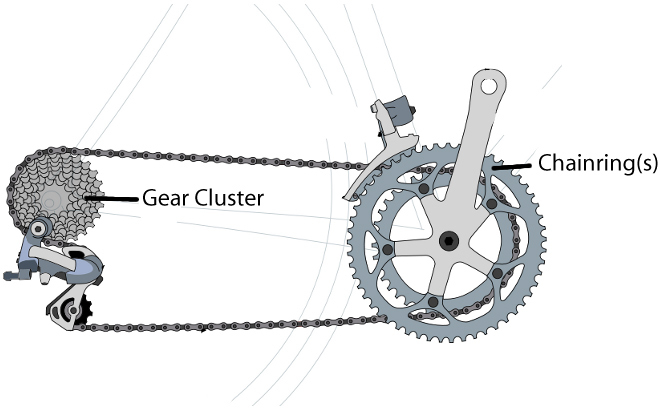 Some of the gear combinations on a bicycle with 2 or three chain rings (CR) will be nearly duplicates. Example: if there are 2 CRs and 10 gears (sprockets) on the rear hub we will say we have 20 individual gear combinations. However… there are usually a few combinations that are almost the same. Most people know this formula: divide the number of teeth in each rear gear into the number of teeth on the CRs. 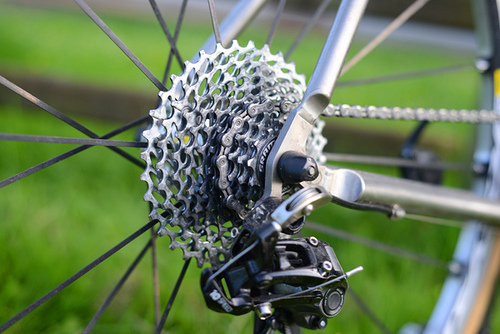 Example: a rear sprocket has 15 teeth and the CR has 45 teeth. The answer is 3. This means every time the CR revolves around once the rear wheel revolves around three times. It’s a ratio of 1:3. Now, take the “3” and multiply it with the diameter of the rear wheel. If the rear wheel is, say 27” tall, the math is 3 x 27 = 81. Do this math with every rear sprocket and the small CR and then do the large CR. You will finish with two sets of 10 numbers and some of them will be very, very close to the same. You will have calculated the range of the lowest gear combination to the highest. Make a small chart of these numbers so it can be taped onto the bike’s top tube or the top of the stem for an immediate reference for shifting. The shifting pattern is confusing as some numbers are so close. The reason we have multi gear selections on the machine is so we can keep our personally favorite and most effective cadence (R.P.M.s) at the same speed no matter what the road conditions are. You should soon know, with the posted gear chart, what your favorite gear choice is to use at your most efficient speed when the road is flat, smooth, no wind, and you are alone. That gear is your middle gear of the entire gear range. The higher the R.P.M.s the lower the pedal pressure.